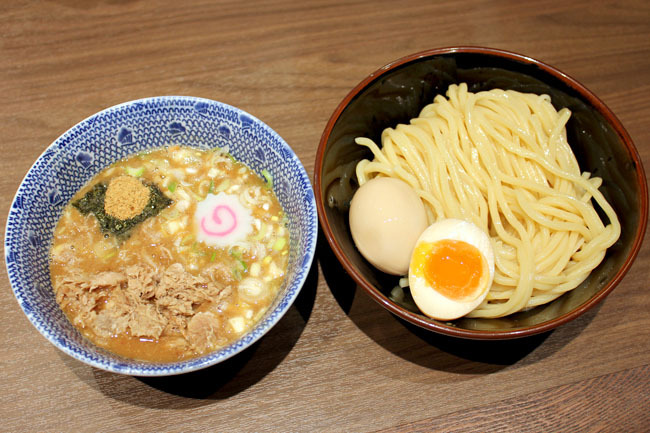 10 Must-Try Ramen & Tsukemen At Tokyo Japan. Oishii Desu! [Tokyo] These are some of the Best Ramen & Tsukemen from Tokyo Japan. 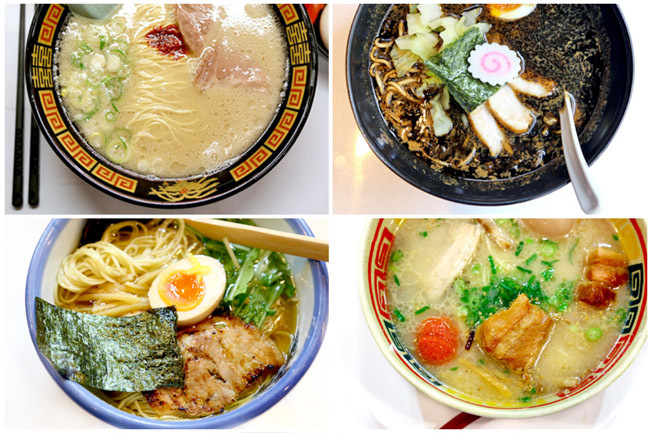 There are just too many variants and combinations, from the Tonkotsu ramen (pork broth) of Kyushu, miso ramen of Hokkaido, to shio and shoyu soup bases. Admittedly, there are some mass-market brands listed here, but they have become widely popular for some good reasons. Tough to be my travel-mate, because I have a bowl every single day (sometimes two bowls) when I am in Japan. You can say I am persistent. Burnt ramen? 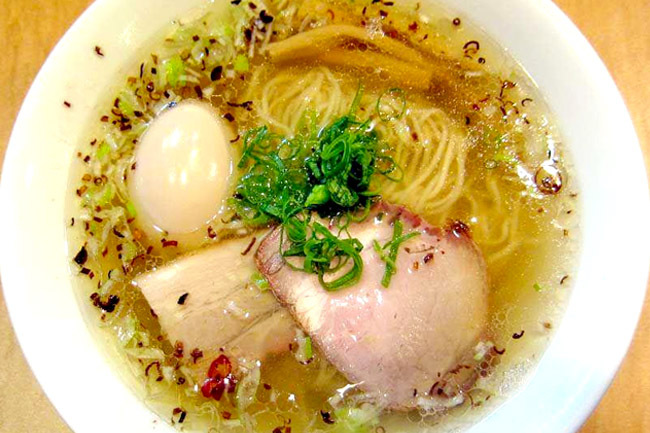 Yeah, Gogyo’s specialty ‘burnt kogashi ramen’ has a miso or soy based broth cooked in 300°C lard. This unique soup base is heated in a wok, igniting orange flames in the kitchen. Also a visual spectacle. You can imagine even the amount of ‘wok hei’ (literally means heat from the work) that goes into each bowl. The Kogashi Miso Ramen arrived with a layer of black oil, specks of char, with a smokey aroma. Take your time to drink that very first spoonful – it was rich, full-flavoured, heavy, with taste permeating throughout. 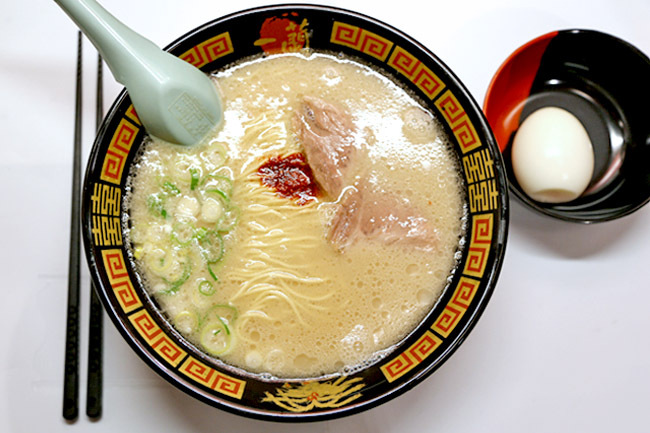 Ichiran Ramen 一蘭 is known as one of the best ramen in Japan, if not the best – mass market wise. Not exaggerating, but my friends would get the urge to fly to Tokyo just have a bowl of this rich Tonkotsu soup based noodles. The shop was founded in Hakata Fukuoka way back in the 1960s. 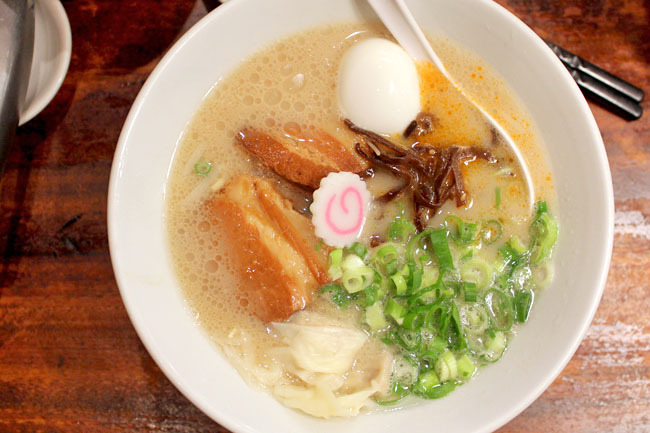 Hakata ramen is characterised by its thin, long, firm noodles, usually whiter in colour. 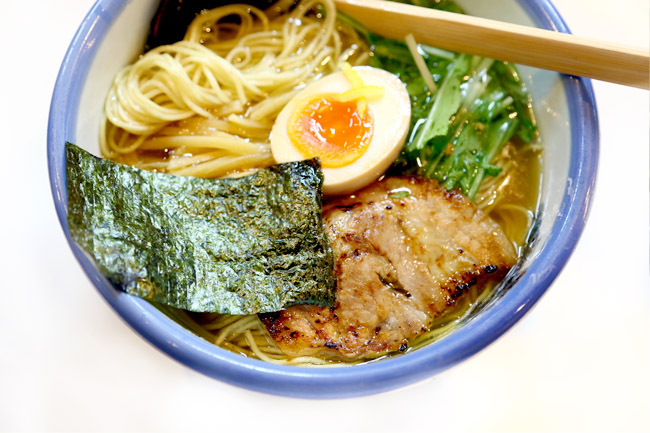 First ever ramen joint to get a Michelin star, which is an indication of its exceptional quality. The 9-seater ramen eatery serves soba in ramen style (850 yen), known for its soy based broth where the soy is aged for 2 years. 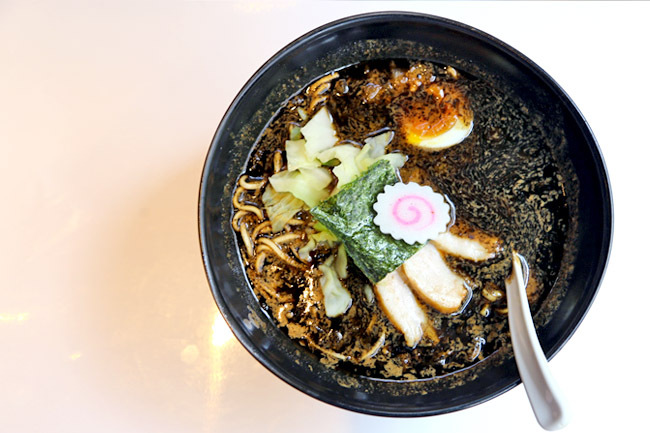 Noodles are made with four types whole wheat flour, chashu served with black truffle sauce, and broth an umami chicken-seafood blend, along with rock salt, red wine and rosemary infusions. Perfection in execution. Mutekiya is one of those ramen shops with only one branch, and has limited sitting of say 20 pax, but it is worth the effort and time to try its legendary ramen. 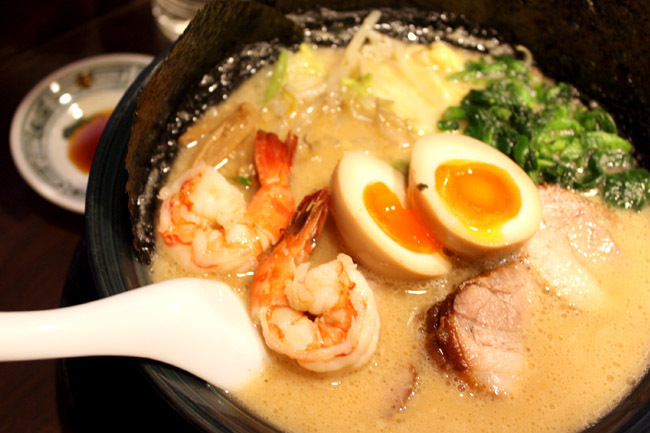 Mutekiya Ramen’s “人气王 Ren Qi Wang” (popular dish) is the Goukai Men (1200 Yen) which consist of a 16-hour boiled tonkotsu pork thighbone broth with thick slices of barbecued pork, a flavoured hardboiled egg, and two pinkish fresh prawns. Ippudo 博多一風堂 was so named because the founder Shigemi Kawahara wanted to “blow wind” over the “dark clouds of the Kyushu ramen industry”, eventually reinventing the traditional style of Hakata ramen in 1985. He eventually won the “TV Champion Ramen Chef” 3 times consecutively between 1995 and 98. With over 65 stores in Japan, Ippudo has successfully put itself on the world map gaining popularity in major cities of New York, Sydney, Hong Kong, Taiwan, South Korea and Shanghai. Musashi is a reference to the sword warrior Miyamoto Musashi, and is also short for 634 (therefore its website is m634.com). Interestingly, the tallest tower in the world Tokyo Sky Tree is also 634 metres. 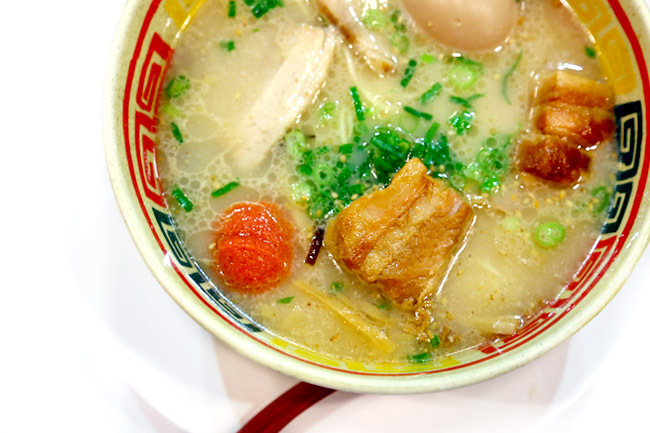 After having so many different types of tonkotsu ramen in Japan, Afuri’s 阿夫利 ligher chicken based stock with citrusy yuzu may add that blossoming in your mouth, and spring in your step. While Afuri also serves salt based Shio (880 Yen) and soya based Shoyu (880 Yen) variants, you should really try versions with yuzu (990 Yen). 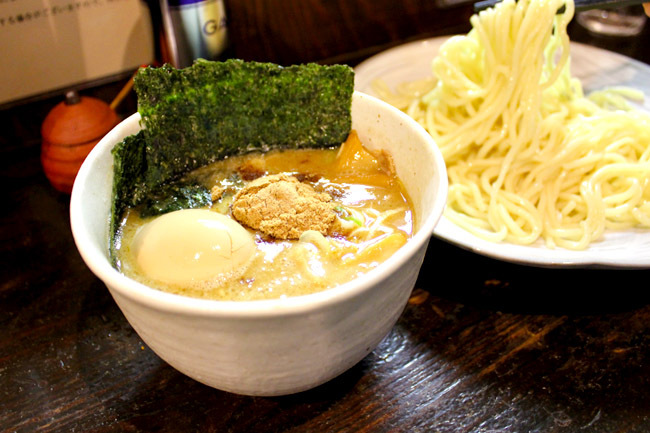 The “godfather of tsukemen” Rokurinsha first opened in Osaki in 2005, and achieved immediate popularity with ramen chart topping results and snaking queues. The shop eventually moved into the “Tokyo Ramen Street” on the basement floor of Tokyo Station and the newer branch at the Tokyo Skytree (also known to be the tallest tower in the world and quite a worthy visit if you go on a blue-sky day). The menu is basic with 3 main choices, the Tsukemen (850 yen), Ajitaman Tsukemen with flavoured boiled egg (950 yen, don’t be silly wanting to save 100 yen for not trying the egg), and the special full toppings Tokusei Tsukemen (1,050 yen). Tsukemen’s main feature is to have really hot dipping soup and mid-cold noodles, and Rokurinsha’s broth full of depth and flavours certainly stays warm till my last dip. Fu-unji 風雲児 is tsukemen like never before, creamy broth of chicken (imagine the collagen) with fish, topped with bonito-like smoked fish powder. This is UMAMI. Kyushu Jangara Ramen is a Hakata ramen chain restaurant, offering bowls of long thin noodles in cloudy rich Tonkotsu pork bone broth. I ordered the popular Kyushu Jangara A (1080 Yen, SGD$12.60, USD$9) which includes chunks of marinated pork, seasoned cod roe and flavoured boiled egg. 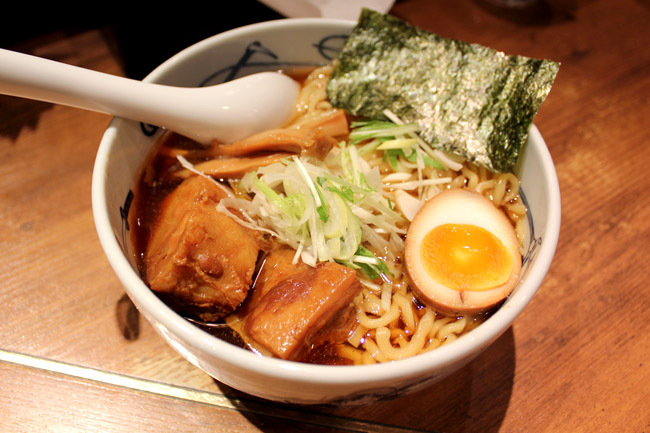 Let me know if there are other worthy ramen to try from Tokyo. Arigatoo Gozaimasu! Ippudo’s Ebisu branch is pretty good too, it has nice old ramen shop feel.